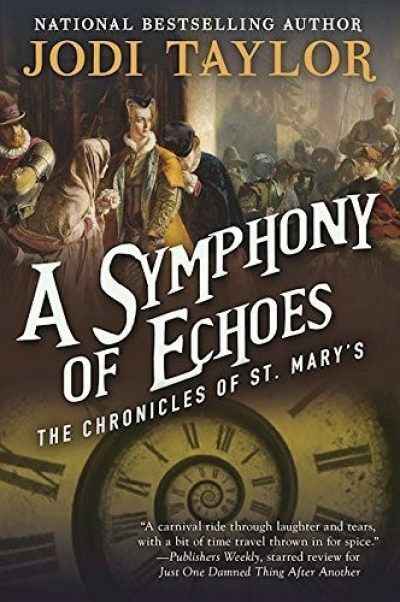 2013’s A Symphony of Echoes is the second volume in Jodi Taylor’s series Chronicles of St. Mary’s. Madeline Maxwell and Kalinda Black’s innocent foray into the late 19th century to seek out Jack the Ripper takes an unpleasant turn when the pair finds Jack the Ripper. Or rather, the Ripper finds them. It’s not clear what the Ripper actually is, but it is clear that it intends to use the St. Mary’s time machine to relocate itself in time. It’s convinced that there is nothing the two historians and St. Mary’s can do to stop it. It is, after all, quite durable and it is willing to use extreme measures to convince St. Mary’s to let it out of the time machine. Its calculations fail to take into account the fact that standard time machine equipment includes a fire axe. No sooner than one crisis is averted than Maxwell has to deal with another. St. Mary’s old foe Clive Ronan, much battered but still alive, is determined to pursue his vendetta against St. Mary’s (and History itself). Ronan snatches Chief Farrell and carries him off to the future. Clues left in the kidnapping’s wake point to Ronan’s destination so clearly that they are clearly a trap. Nevertheless, Maxwell pursues Ronan. She finds a future St. Mary’s firmly under the control of Ronan’s gang, its surviving staff imprisoned. Unfortunately for Ronan, the staff managed to send their time machines away before Ronan could commandeer them. Even more unfortunately for Ronan, among Maxwell’s many talents is a prodigious capacity to confound Ronan’s plans. Unfortunately for Maxwell, time travel means dealing with one instance of a foe does not mean one will not have to deal with a different instance, one protected by causality. History will prevent Maxwell from simply putting a blaster bolt through young Ronan’s head to keep old Ronan from launching his various schemes later in his personal timeline. Which is terribly inconvenient for St. Mary’s, as they realize a younger Ronan was intriguing to put Mary Queen of Scots on the English throne. And that for some reason, History did not simply strike Ronan down on the spot. History has its preferred tools. In this case, that would be St. Mary’s and Maxwell herself. Like the first volume in the series, Echoes is an odd mix of brutal violence, emotional trauma, and funny bits. A bit like life, I suppose. IMHO, St. Mary’s problems are due to the fact that, despite its pretensions of professionalism, the place is run with the same sort of ad hoc improvisation and cronyism as one might expect from a not-especially-well-run amateur theatre company. St. Mary’s rules consign redshirts like young Ronan’s beloved girlfriend to the grave, but they can be waived if they inconvenience Important staff1 like Maxwell. Staff assignments are handed out by administrative whim. Much the same is true of the missions to the past. Some expeditions are selected to achieve specific, tangible goals. Others are selected because Maxwell and her chums get a sudden urge to hare off to some ancient era to sight-see. Which they can do because they have the keys to expensive time machines. History can of course protect itself, but the cost is an impressive body count among those members of staff who are not Maxwell. I might have accepted the body count as necessary to comedic time capers, but part way through the novel Maxwell does something that pretty much killed dead my interest in reading further books in the series. Determined to ensure that Mary marries James Hepburn, Earl of Bothwell (as happened in the St. Mary’s home timeline), Maxwell lures Mary into a room where a drunken Bothwell is waiting to sexually assault the next woman he encounters. Presumably, having been assaulted, Mary will then have to marry her attacker (for all the good that does Bothwell in the long run). You’re cold and wet. It’s been a tough assignment. But, for us, it all happened hundreds of years ago. What you did was meant to happen. She could have screamed for help. She could have denounced him. She didn’t. Not originally and not on this night, either. I understand how you feel – she might have gone on to be a remarkable woman. But she made bad decisions and she had to live with them. And remember – she was no innocent. I say “bah” and I won’t be reading any more of these. A Symphony of Echoes is available here (Amazon) and here (Chapters-Indigo). 1: There’s no reason to think Ronan is aware of this, but if he is, it can only fuel his dislike of St. Mary’s.